You are here: Home / Academentia / Dy-no-mite! From the latest biography of the Ur Existentialist, I Am Dynamite!, by Sue Prideaux. 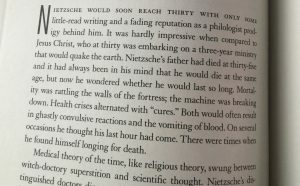 On the whole it’s very good, and of course Nietzsche really did sign his letters as “the Crucified” towards the end. But this seems to expect an awful lot of the poor guy.